1Don't let Kirk Kerkorian run the company. He's interested only in lining his own pockets. 2Don't sell out to Renault-Nissan. GM should stay a Detroit-based company. 3Focus on more fuel-efficient vehicles. 4Develop distinctive designs that clearly define each brand. 5Require GM retirees and workers to buy GM cars. If you don't support your own company, who will? "It won't be GM as we know it. The name might still be up here and the logo downtown, but it won't be GM the way we know it." -- Ed Kulba, an 80-year-old GM retiree from Canton. "I don't like it. I'm scared they might close out our benefits, our pension. Little by little it's happening." -- John Maliniak, 83, a GM retiree from Westland. "I think it's just to line his own pockets. I don't trust the guy myself." -- George Schoen, a 79-year-old GM retiree from Plymouth on the motives of GM shareholder Kirk Kerkorian. "I'm looking more for this generation, the future people. Me, I'm 90. How long am I going to be? I hope that the future generation is going to have something." -- Al Wrobel , a 90-year-old GM retiree from Wayne. Al Wrobel, 90 years old, puts down his cane and pulls up a chair at a table in the center of the Meijer coffee court in Westland. 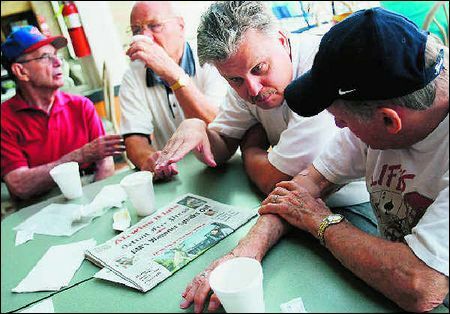 Like most weekday mornings, Wrobel, a General Motors Corp. retiree, is surrounded by a handful of other GM retirees, an informal coffee club. This morning, they have plenty to talk about with news that their former employer is exploring an alliance with Renault SA and Nissan Motor Co. The possibility of a GM-Renault-Nissan partnership is troubling, Wrobel said. Although the executives from the companies have said they're exploring an alliance, not a merger or takeover, Wrobel worries that this could mean more. He's afraid it could be the end of the GM he helped build. "I thought it was terrible, horrible," Wrobel said, when he saw reports of the possible alliance. "It was the first time I thought of losing everything." For Wrobel and the other retirees, it's hard to understand what's happened to GM and the U.S. auto industry. Most of them started working at GM in the 1940s when the company and the nation were on the rise. They remember a time when GM built half of all cars on U.S. roadways. For at least seven or eight years, Wrobel and five or six friends have gathered in Westland for morning coffees to talk about weather, women, politics and General Motors: past, present and future. They are among more than 450,000 GM retirees and surviving spouses. The members of this group range in age from 79 to 90. Three of the five retirees gathered this particular day are widowers. They decided to start meeting for coffee after they kept bumping into each other during walks at the nearby Westland Shopping Center. The coffee chats give them something to look forward to each day. For 50 cents, they grab a cup of coffee, unlimited refills and a good hour or two of conversation, just to remind them of their working days. Wrobel, the lone management retiree, scribbles citations on white napkins and hands them out. "If they get in late, I write 'em up," said Wrobel, who used to be a foreman at a GM plant in Redford. Since their retirement, GM has been fighting to slow its market-share decline. But they all learned to live with the ups and downs of the auto industry long ago. During tough times, they mowed lawns, painted houses, worked in scrap yards and cut hair to make ends meet. Periodic layoffs have been part of the auto industry for decades. But the angst is higher with GM's most recent difficulties. They're worried about their pension and benefits if a foreign company gains control of GM. Just as much, they are bothered by the message it sends, that GM needs a partner to bail it out. In a recent Detroit Free Press-Local 4 Michigan Poll, at least half of all respondents said an alliance with Renault-Nissan would be good for GM and for the U.S. auto industry. Among those 65 and older, only 40% thought it would be good for GM, and 32% thought it would be good for the U.S. auto industry. Ed Kulba, an 80-year-old GM retiree and World War II veteran, doesn't see the benefits. He started working in a Detroit auto factory when he was 17. He cringes at the thought of a French or Japanese company controlling GM. "This is what us World War II veterans went over to fight for, so we could keep it American," Kulba said. If GM paired up with Renault-Nissan, they fear Detroit could lose another member of the Big 3. Chrysler Corp. merged with Daimler-Benz in 1998 to form DaimlerChrysler AG, and German executives control the overall company. "It won't be GM as we know it," Kulba said. "The name might still be up there and the logo downtown, but it won't be GM the way we know it." These GM retirees are not happy with Americans buying cars made by foreign companies, but they also admit that GM has made mistakes. They say GM has focused too heavily on trucks and SUVs and is now suffering under the weight of higher gasoline prices. They also said the company has failed to come up with enough exciting new cars. "They're not changing the product," said George Schoen, a 79-year-old retiree from Plymouth. "They're not coming up with new ideas." When he worked for GM, the company was known for churning out eye-catching cars, Schoen said. Now, it's hard for him to tell them apart. "They all look the same," Schoen said. "I have to go around the car and see where the emblem is to see what kind of car it is. That's ridiculous." They've watched brands such as Buick lose their luster. They've watched Oldsmobile die. They hope GM can turn around -- and on its own. But as retirees they know their voice doesn't carry much weight. "You can't do a thing about it," Wrobel said. "I just hope. ... Me, I'm 90. How long am I going to be? I hope that the future generation is going to have something."